On Second Scoop: Ice Cream Reviews: Jeeg has now been to Hy-vee... have you? Jeeg has now been to Hy-vee... have you? Recently our podcasting buddy Jeeg from the Nerd Lunch podcast moved to Minnesota which means he now gets to shop at Hy-vee. Knowing that I'm a grocery geek, he kindly sent over a few shots from the freezer aisle. It can be easy to forget that our local freezer aisle is part of a much larger stage of frozen treats. Let's take a quick look at a few things you might not usually see. The coolest find has to be Whitey's Sgt. Camo Ice Cream. It's graham cracker and marshmallow ice cream with a ribbon of Whitey's famous fudge. That sounds amazing to a graham fanatic such as myself. In fact, I think I've heard of either Whitey's or this flavor in particular before. If any has tried Whitey's, let us know in the comments. Now, what else do they have? 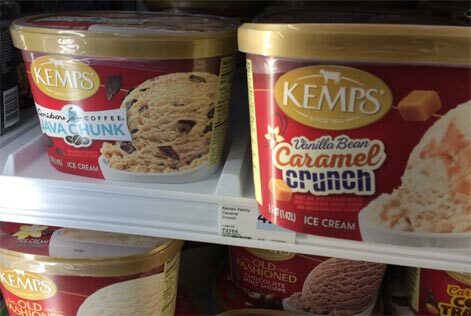 Kemp's is another midwest mainstream staple. I see their froyo in the northeast but never their regular stuff. Do we have any Kemps fans in the house? I meant to try and figure out what they have new for 2017 besides their new Yo2 stuff. 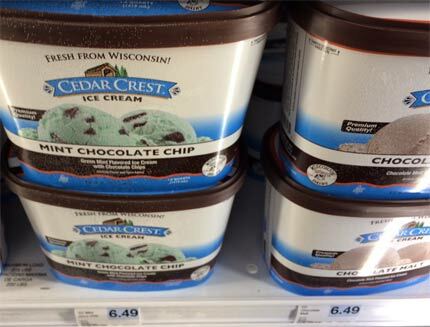 Cedar Crest is another midwest mainstream staple. Nick and I have actually tried them. I tried them a few times thanks to the ice cream of the month club (yes, that's a real thing) and Nick ordered his online. Unfortunately I have no idea how prolific they are about creating new flavors. 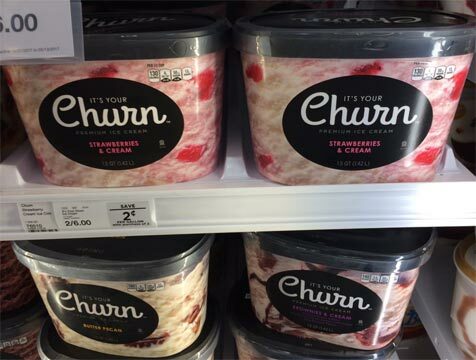 Corny names usually mean store brand and pretty sure It's Your Churn is the in house brand for Hyvee. In house brands are usually priced about the same as budget brands but because it's somewhat "generic", they can be a bit better or more creative in an attempt to be more like a mainstream brand. This all depends on the company as these are just general rules of thumb, nothing more. There appear to be 21 varieties of traditional sounding flavors. 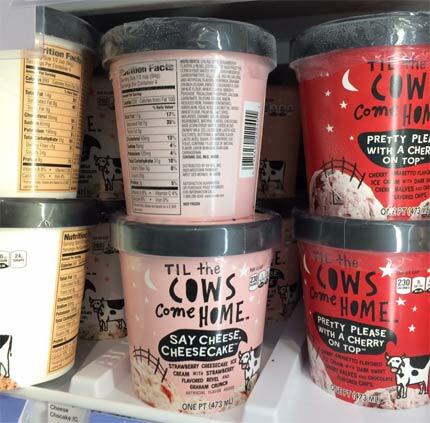 Til the cows come home is the super premium pint version of It's your churn. There appear to be about ten tasty sounding flavors that have more clever names and flavors than there 1.5QT counterparts. Has anyone tried these as I've been curious about them since they came out. 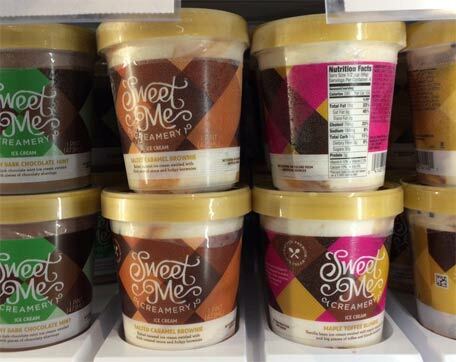 Last one for now: Sweet Me Creamery is available all over the midwest and I'm curious if anyone has tried them. They have an about page but it doesn't have your typical "one day Billy found his great grandma's recipe for frozen rhubarb custard and decided to start an ice cream company way back in 1961". I'd be more than happy to try them if they were in my area. Ok, that's it for now. I know we don't have a ton of readers from the midwest but if you've tried any of these flavors, please let us know. Many thanks to Jeeg for the pictures. I love Kemps! I really love their vanilla sugar free frozen yogurt. My mom won't eat any ice cream besides Kemps toasted almond fudge. Actually they used to run a contest for a new flavor, and people would taste test and vote on the flavor at the annual State Fair in August. Then they would make the winners a limited edition flavor. I remember a few winners were mini donuts, sweet Martha's cookie jar (the most famous food booth at the fair), and pistachio fruit party (like the salad). They haven't done it for a while but it was pretty fun! I've tried Dough-Mi Arigato, Mr. Roboto from Til the Cows Come Home. It was a pretty standard cookie dough ice cream if I recall. Nothing spectacular. I'll have to try out the Whitey's Camo and report back. I also want to try the Meijer brand Purple Cow Campfire S'mores. God there's so much ice cream out there. I'm a midwest person currently. I'm still a bit far from a Hyvee though. I'll have to keep an eye out now and look for stuff. I'm still getting acquainted with my frozen aisle shopping choices within a reasonable driving distance, lol. 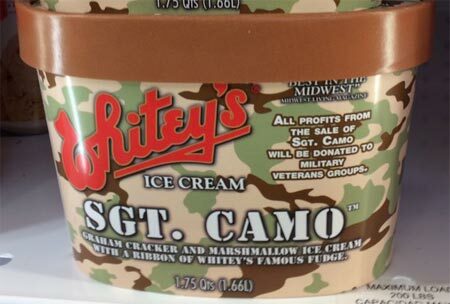 Whiteys has an in-store flavor called Graham central station. if you like Graham cracker, you'll love this. HA! Someone tweeted me a pic of GCS!